I do appreciate the vast amount of knowledge and experience in the art of letter press that can be found on this site. So i pose the question of building one’s own press. I have an idea in mind, simple, cost effective. Can it be done, should it be done? Any suggestions? If you want to build a press, you should build a press. If you want to print, you should (probably) buy a press. Zachary, depends on what you want to accomplish, there’s nothing stopping you, really. There’s people who have done it before. The results vary depending on your level of skills and creativity. One of the finest printers I’ve ever known, Ian Robertson, used a hand-made handpress and his work is legendary. Builidng your own press a press is a great way to get into letterpress without having to invest an arm and a leg on machinery. It’s actually not very difficult, and affords a person a better understanding of what is really essential in printing. I’ve built half a dozen presses over the years, and print with them regularly. None of them were created simply for the “Joy of Press Building”. In fact, each one was created for a specific task for which they were better suited than the cast-iron presses that were available to me…. like a larger print area, or better portability, or lower cost. While they are different than my factory-built presses,and certainly slower to use, they are capable of some very fine work. Zach…. of course you can build your own press, and I would encourage you to do so. If you do a search here at Briar Press, you will find quite a few postings from folks who have built and print with home-made presses. I myself have two or three presses shown….. and know of quite a few copies of them being built and used by Briar Press and Wet Canvas (an Art forum) members. You can alos find here several discussions of impression pressure requirments, platen vs cylinder presses, and so forth. If you do build a press, one recommendation: use a cylinder press configuration, similar to a proof press. The smaller contact area allows for greater impression strength…. which is an important consideration when using wood as a primary material. Good luck, and let us know how you are progressing. There is a big gap between a beginner who just can’t afford a real press, and an experienced printer who has an idea for press building. The difference between a Har-Ma and a rolling pin is huge. WK, I didn’t mean a printer can’t build a press, I meant he should do what he wants to do. If he has the itch to build a press, has some ideas he wants to explore, then go for it! I’m a great fan of building things. And what could be more satisfying that using the press you designed and built? But if he’s just trying to print, has some ideas he wants to explore, then he should buy a press, some press, somehow, and get after it. Spending even a month building your own press when what you really want to do is print seems a waste to me. Seriously. Your month could be much better spent staring at eBay waiting and praying for a press to come along that doesn’t cost $10,000 or more. Good points, all. Especially if you are thinking about a platen press with grippers and automatic inking. Such a machine can be a bit time consuming to build….. and can indeed overwhelm a newbie. So can a handpress with typman and frisket, and huge wooden screw. BUT…. you don’t need such a machine to print good work. A simple proof press need not be anywhere as complex, and can be built in a week-end using materials available from Home Depot. Such a machine is capable of printing very nice work within it’s limitations. And because of it’s nature, it teaches the fundamentals of relief printing in a way that more complex machines can’t. No… the simple proof press is not very fast, and no they won’t do deep impressions very well….. but they CAN print multiple colors with very close register using a pin register system. They can print large areas of image without a lot of difficulty. And, they are adaptable to virtually any kind of type / relief image system…. like PP plates, wood blocks, or metal type. Over the last several years, I’ve helped quite a few newbies build and use simple proof presses, with very good results. Most folks are printing passably good work in a week or so, and have it down to a science in a month. It’s easy, inexpensive, and far more capable than most folks realize. The best way to keep yourself up and printing is to understand your press; how can you fail to understand your own press that you yourself built? If I might weigh in on the subject- there are various “parts” available on the industrial market that one could buy and reverse engineer, repurpose, and fabricate together to make a working proof press. Hydraulic presses that are actually designed to press bearings and other parts, to simple leverage presses of a similar design, “jig plate” which is already machined to tolerances necessary for our style of printing, various fasteners, etc.- one can fabricate a basic proofing press many different ways without having to complete even that many actual precision machining tasks. If you know your way around tapping and threading, it gets even easier. I say press on towards your goal- the worst that could happen is you end up spending some time learning how to make something that you understand the insides of, rather than printing for that month. If your goal is to build your own press to print with, it’s a worthy one to me- and understanding the insides and inner workings is a lot more than the typical non-curious letterpress printer, who merely wishes to put ink on paper, is capable of having an interest in. Why do you think we have so many posts on the website that say things like, “My press isn’t printing correctly, what am I doing wrong?” and then the person later finds out something was incorrectly assembled, or any other number of mechanical follies, are placed in front of them like hurdles to overcome. HavenP, you are exactly right. There are all sorts of machinery parts and materials out there just waiting to be used. My personal favorite is aircraft-grade birch plywood. It’s very stable, and comes in great 12 x 18 x 3/4 pieces. Two pieces glued together make a GREAT press bed that lasts for years and years…. AND it’s available at Hobby Lobby, woodcrafters, and most hobby shops. Nowadays, even Home Depot carries great wood. you are also right about hydraulic jacks. I know a number of folks who use “bottle jack presses” to good effect. Another great piece of gear is an Arbor Press….. available at Harbor Freight for perhaps $35. I used one of these for a blind embossing / die cutting machine, and it works like a champ! Why bother to build a press? A spoon in the right hands will suffice. I’ve been wanting to learn how to cast iron for a while. Come over to Virginia and we will figure out how to make a new-old-style C&P. On second thought, the wife would probably kill me if I tried to pick up another major hobby project. yes Gerald, a spoon in the right hands will indeed work. If you look at the fabulous Japanese prints of the 19th century, you’ll see what is possible using simpler tools. The same techniques also work extremely well with PP plates, or lazer cut woodblocks. Thanks for endorsing my point. It really appears to me that those who have actually built and used a hand-made press tend to understand that they can work quite well…. and for some inexicable reason, a few people actively try to suppress or at least discourage people from straying outside what they feel is “the right way to print”. With relief printing, I’ve got just as good results from a Japanese Bamboo Barren as I did from a press that I designed and made from some welded steel, thick plywood and a $6 car jack ! Either way was fun and rewarding in any case ! Depends on the type of press.I built my own roller press from easily obtainable materials for etching and lino cuts.Bearings had to be purchased to enable the press to carry the necessary loads but everthing else i either had in the workshop or bought from my local DIY.If you can’t weld you can get someone else to do this part.see my blog on Hentzant.blogspot.com to see how I did it. Nice looking press Ken. Well Done. I agree ! Excellent press Ken. DIY is hardly a new idea. Printing was accomplished in Europe a century before Gutenberg and in Asia hundreds of years before that. Whether or not the European work was accomplished on a press is unknown but the Asian work certainly was not. Very crude and elementary techniques can be used to print but they often yield very crude and elementary printed images. Gutenberg’s presses were fairly refined so something similar likely existed prior. These wooden common presses were built by a carpenter to Gutenberg’s specifications, not by Gutenberg himself. These were based on paper mill presses and may have been equipped with a primary refinement, the hose, a means of leveling out the impression. This basic type of press was used for most printing right up into the 19th century. It’s main drawback, because of the impression requirements, is that it literally had to be built into the ceiling structure of the building that housed it to provide offsetting strength. An important consideration for any press. Nothing wrong with a DIY press, except if you have clients. They tend to by picky about stuff. You know, like the printed image. In which case you’d likely want a industry manufactured press that was the evolutionary result of the last five centuries of mechanical and technical know-how and engineering. Good points Gerald, especially about using a press for commercial purposes. I would agree that if one wants to print for commercial clients, then a manufactured press of high quality is a necessity. I certainly don’t use my wooden presses for commercial work. They are indeed a bit slow when printing more than a few copies. On the other hand, most of the folks who visit here and inquire about building their own presses are more interested in printing as a form of personal expression, or artisitc endeavour, not as a commercial enterprise. I can only partially agree about the refinement of printed image using simple tools. Yes, simple tools in the hands of a newbie do tend to produce less refined images. At the same time, newies also tend to produce less refined images when using factory-made presses, especially if they are self taught. We both know that used correctly, even very simple tools can produce some exquisite images, as evidenced by the Japanese Floating World prints, and the work of such printers as Ian Robertson, David Bull, and many others. Sure, the refinements of the last five centuries are indeed remarkable. Nothing is more amazing than a Windmill in operation. They can put down some amazing images quite fast. If you need to zip out a few thousand pages, they are great….. but if you don’t need to print more than a dozen copies of an invitation, they are technological overkill. They weigh a ton and take a skilled technician to operate. They are also quite expensive nowadays, as are Vandercooks. Also, at the very low volumes of printing that most printers here produce their speed advantage is not really evident, especially if they are using PP plates. In the time it takes just to order and recieve the PP plate from Boxcar, and set up the press, a wood-block printer can already have his block cut and his dozen invitations printed and in the mail. You also mention that the flatbed presses of old required a post to the roof to gain sufficient pressure. You are right, they did…. to print a large area, like a 12 x18 or so. Is that any different than having to reinforce your floorboards to hold a 12 x 18 letterpress that weighs more than my car? I don’t think so. I agree with you that if larger presses are required, then a person should learn to use the larger, factory made press. If however, one is just learning the fundamentals of relief printing or wants a compact, portable, easy to use method of printing for personal use, then a home-made press is a very good choice. 1. Although wood is almost non-existent in modern machinery, it is a much more suitable material than modern manufacturers would lead a person to believe. I have used wood to great success. One nice thing about it is that if you make a bearing out of it (I use quality brad point drills for this), oil will soak into it and retain the lubrication properties longer than metal. One reason that wood type is so successful, other than the light weight, is that where metal type wears, wood type can give a little, which reduces wear. Also, folders had wood bearings for years for this reason. In the 19th century, many fine and precise machines were made of wood to various degrees. 2. One of my favorite sayings is: “Things get more complicated with time.” If one thinks about many areas from machinery to income taxes to (insert category), this is true. I think it is important to guard against this where possible in our field as well as in other areas of life, because the added complication often does not equate to added enjoyment of life. Good thing none of us are using computers then. Talk about complicated technology. I remember a time when you could build our own. You could buy the parts at Radio Shack. DIY. Ha! DIY printing with a buck sheep for a press. 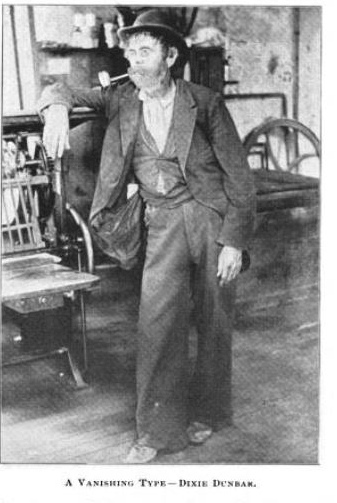 One of the stranger tales ever told of ramshackle equipment was related to John Edward Hicks by a tramp printer named “Dixie.” Hicks crossed paths with Dixie, a Confederate army veteran, in Atlanta, whereupon he spoke of a most unusual print shop indeed. The equipment at this place had consisted of nothing more than a big shelf covered with a scattered assortment of old wood type, a rack of primer, a dilapidated composing stone and two composing sticks. There were not even any galleys for storing composed lines of type; the editor instructed Dixie to tie them with string and hang them from nails that encircled the empty room. After a bit or research, it seems that the “Dixie” tramp in question is none other then a famous Dixie D. Dunbar, also know as the “King of Tramps”. He was born in Ireland and his parents removed to Macon, Georgia, shortly before the rebellion. He was an officer in Colonel Claiborne’s confederate regiment and did service for the South. He was taken prisoner and transported to Johnson’s Island, in Lake Erie, where he suffered extremely from the cold. Going by these dates, it appears old “Dixie” spent some foutry-fifty years tramping. It is claimed, in addition to exemplary printing skills and an ability to spin a good yarn, he had photographic memory and never forgot anyone he worked with throughout his travels. I have been racking my brain, going through every mechanical way to go about this. Scouring the thrift store i work in and Ace Hardware for ideas. I finally believe i have come upon a good idea. I have a design in mind, i have sketched it out and thought of everyway it can go wrong and corrected it. I hope to build it soon or maybe scan my drawings and put them online. I have an image of a signpress, and it has moveable combs? Where could i get something like that? Would i need something like that? The Internet [Google ?] had some items about building a press, some of the presses rather primitive. Some articles referred to “plain” surfaces; should that word have been “plane” ?